So you think you’re an ace tree identifier. Those big scalloped leaves are from oak trees, the three-fingered hand shapes are maple leaves, those little oval leaves marching in a double line along a stem are from an ash—boo yah! OK, now do it without any leaves. And yes, you can…with a little help from Jim Jabcon, assistant ecologist for natural areas. The other day Jabcon, walked me through the McDonald Woods and began my education. 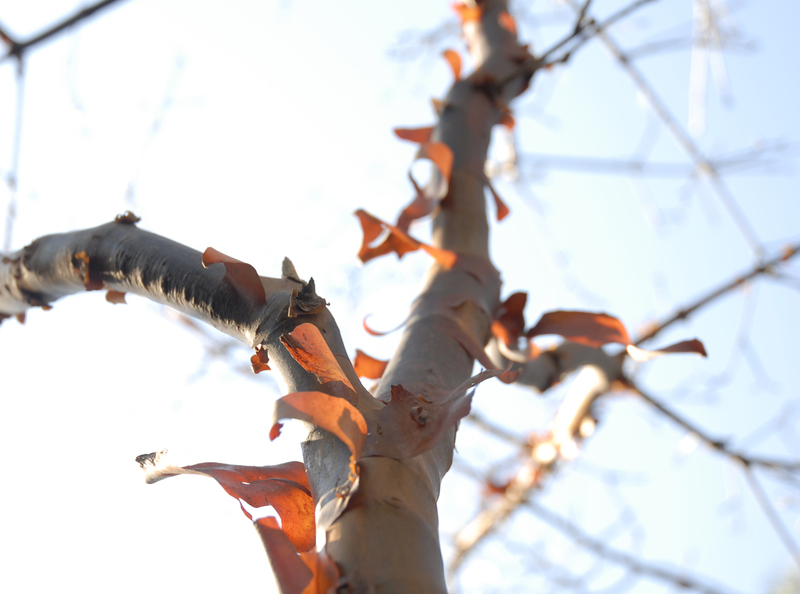 Jim Jabcon is giving a class on Identifying Trees and Shrubs in Winter on December 10. Sign up today! First, he corrected my misinformation. I always thought the trick was looking at the tree’s habit—its size and shape. But no—especially not in a natural woodland like this. A tree’s habit depends on where it is growing—how crowded it is by other trees and what it has to do to catch some sunlight. Still, there are some distinctive shapes. Does the tree have thick branches, even at its top with a fearsome, gnarly look worthy of a horror movie? Jabcon nodded at a towering behemoth that could have played a role in The Exorcist: it was an oak. But let’s start with a major clue: bark. Jabcon cast a practiced eye—an artist’s eye, in fact, for his degree is in fine art—over the trees. He pointed out a tall tree whose trunk was covered in thick, rough bark. That bark is the giveaway. The tree was an oak; the tough bark is its secret to surviving fires. Nearby, another tree boasted thick bark with a rugged geometry, forming blocky rectangles running vertically up the tree in a kind of forest version of cubism. It also had another tree, a small sapling, growing in a crook about 5 feet up. Jabcon pulled it out and showed how its slender reddish branches were covered with a white chalky material that scraped off easily. “This is your box elder, in the maple family,” he said. And further along the trail was a tree that won my heart because it looked like another part of a human body. Its smooth, gray trunk was wrapped in bark with the sinewy look of muscle. 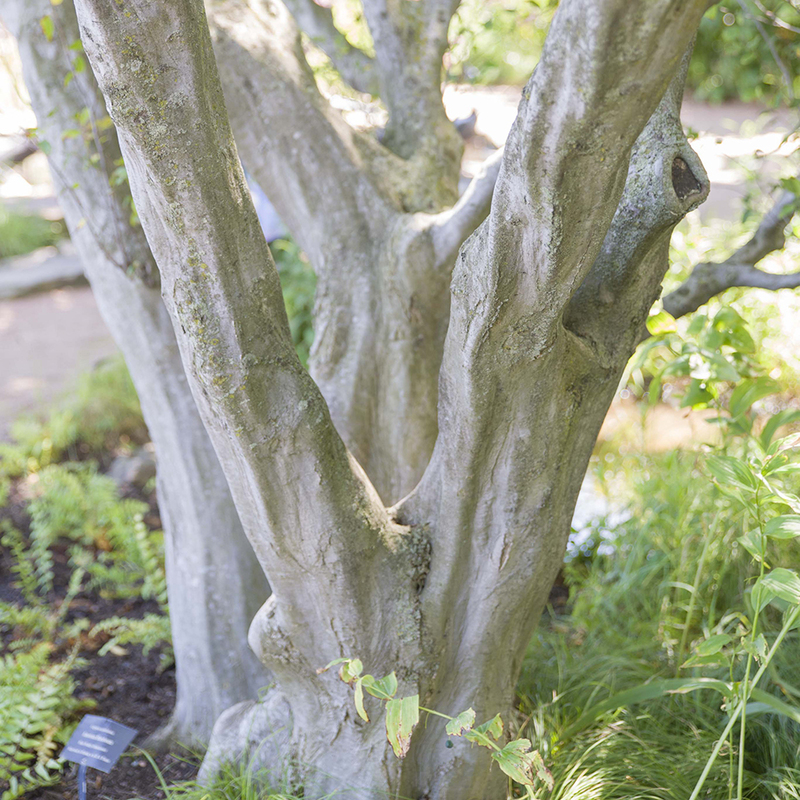 That was because the tree was a muscle wood—the common name for an American hornbeam, bestowed because of the signature appearance of its bark. 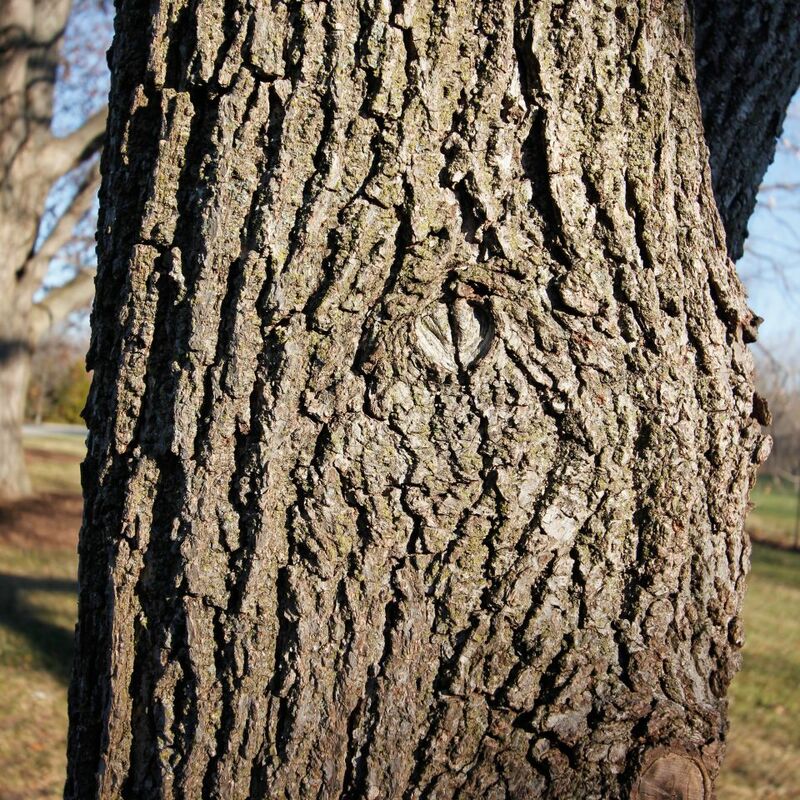 Blogger Kathy J. gives you a Tree 101 on hackberry in her post This Bark is Rough. Still, bark isn’t the only clue. Jabcon pulled a slender branch close and examined the leaf buds running along its length. To make the final ID, he examined the terminal bud—the bud at the very end of the branch. It consisted of a cluster of three tiny points, making the branch look almost like a miniature deer hoof. That distinctive shape settled it: this was a white ash. And so it went as we wandered through the woodland. We looked at leaf buds, like the sulphur yellow leaf ones (“I love how cool they are,” Jabcon said) on a bitter nut, one of his favorite trees. We looked at terminal buds, like the super-long ones that look like a goose’s bill and mark it as a nannyberry, a kind of viburnum. We looked at bark, like the one hanging in huge strips off a tree. 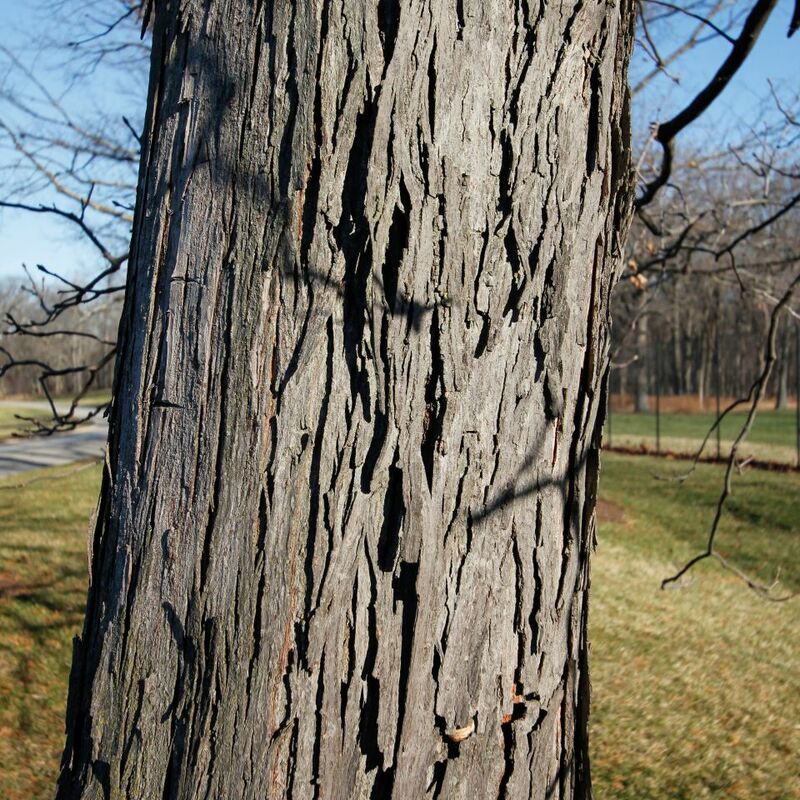 It was a shagbark hickory. This tree’s bark has peeled off in such big pieces that bats have hibernated beneath them. And if all else fails, there is another clue still there in winter, though soon it could be hidden under snow.